My name is Melenia Agapides! I live in an island of Greece and am mother of 2 kids, as well as an Airport Authority Officer at our local airport. I started scrapbooking in 2009, but I got more involved in 2011. I’m a layout designer and I love working with masks, inks, pastes, mists. I think my style is still evolving, so I can’t put a name on it, but my pages contain clusters with different kind of embellies, which I “glue together” with paints, mists and inks. I recently won the Supreme Scrap Tournament (layouts section). My works have been featured in several challenge blogs and have been published in magazines. 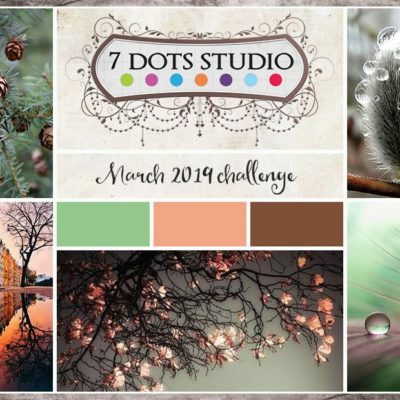 I’m very honoured to be a member of this unique DT and I thank Tusia for trusting me with the stunning 7 Dots Collections!